Life-size cars, headdresses, abstract sculptures, Baroque-style frames, intricate portraits of cities... all crafted from cardboard? If seeing is believing, a dip into The Art of Cardboard: Big Ideas for Creativity, Collaboration, Storytelling, and Reuse will definitely make you look at the humble cardboard box in an entirely different light. 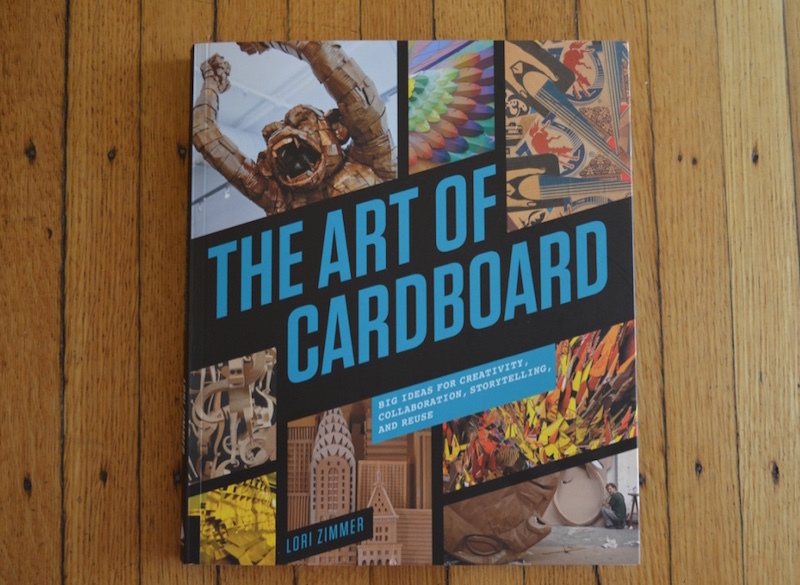 Curated by Lori Zimmer, an art rep as well as a veteran writer for Inhabitots and the art editor of Inhabitat, The Art of Cardboard delves into the inspiration, technique, and ethics behind the innovative artists who turn a utilitarian material into a surprisingly versatile artistic medium. 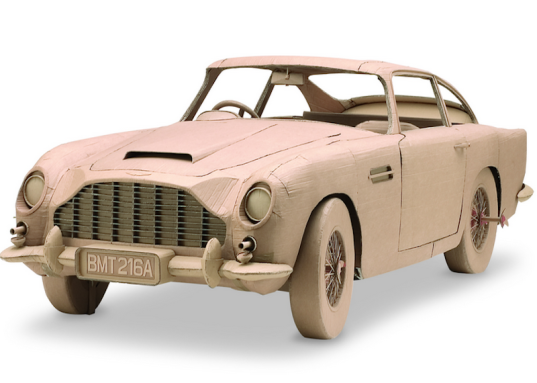 The Art of Cardboard showcases artists who are stretching the boundaries of cardboard use. The book also displays huge variations in the size of the pieces. For example, Chris Gilmour’s sculptures include life-size cars and Luis Valdes creates entire to-scale scenes of a vegetable stand or a cardboard house, while Daniel Agdag’s intricate masterpieces can fit under a bell jar and include complex gears with incredibly intricate details. The artists also vary in how they perceive their work. The parents behind Cardboard Box Office repurposed their moving boxes into scenes for their favorite movies and view the endeavor as a creative way to involve their young son in their art. Ann Weber’s sculptures, which reflect her prior training in ceramics, transcend the look and feel of typical cardboard craft (and reach heights upward of 15 feet) to become fine art. Andy Barrett turns recycled cardboard into beautiful mosaics that also refer to consumer greed and waste. Zimmer includes the work of dozens of cardboard artists and details each person’s background and varied influences. Many of the featured artists were classically trained in sculpture or as an artwork conservationist, and they apply their expertise in unconventional ways. These craftsman show movement through dancing figures, architectural details within a Berlin neighborhood, and transform plain old cardboard into astonishing textures and forms including an extremely realistic horse’s head. Even the corrugated insides of cardboard are utilized and made into homages of classic art (such as Munch’s “The Scream”). While some of the artists use recycled cardboard as part of a larger environmental message, others favor the material for its ability to be shaped and molded into surprising forms, as well as being less expensive than many other artistic media. Regardless of their influences or aspirations, the artists featured in The Art of Cardboard invites readers to expand their ideas of what is possible from any material they have on hand. The DIY section at the end, including cardboard fish, stenciled wrapping paper, and a stacked table, is the perfect culmination of an inspiring book. The Art of Cardboard showcases artists who are stretching the boundaries of cardboard use. The book also displays huge variations in the size of the pieces. For example, Chris Gilmour's sculptures include life-size cars and Luis Valdes creates entire to-scale scenes of a vegetable stand or a cardboard house, while Daniel Agdag's intricate masterpieces can fit under a bell jar and include complex gears with incredibly intricate details. The artists also vary in how they perceive their work. The parents behind Cardboard Box Office repurposed their moving boxes into scenes for their favorite movies and view the endeavor as a creative way to involve their young son in their art. Ann Weber's sculptures, which reflect her prior training in ceramics, transcend the look and feel of typical cardboard craft (and reach heights upward of 15 feet) to become fine art. Andy Barrett turns recycled cardboard into beautiful mosaics that also refer to consumer greed and waste.